The perfect combination of dense storage and selectivity. Push-back pallet rack combines the high density pallet storage of drive-in rack with the 100% SKU accessibility of selective rack. This system is perfect for high volume, low SKU, material handling operations running a LIFO product rotation. It is designed as a series of nested carts (from 2-6 pallets deep). As the pallets are loaded using a standard forklift, they are gently pushed-back exposing the cart beneath readying it for the new pallet. As the pallets are retrieved, gravity glides the carts back along the slightly inclined rail into the nested position at the aisle face for reloading. 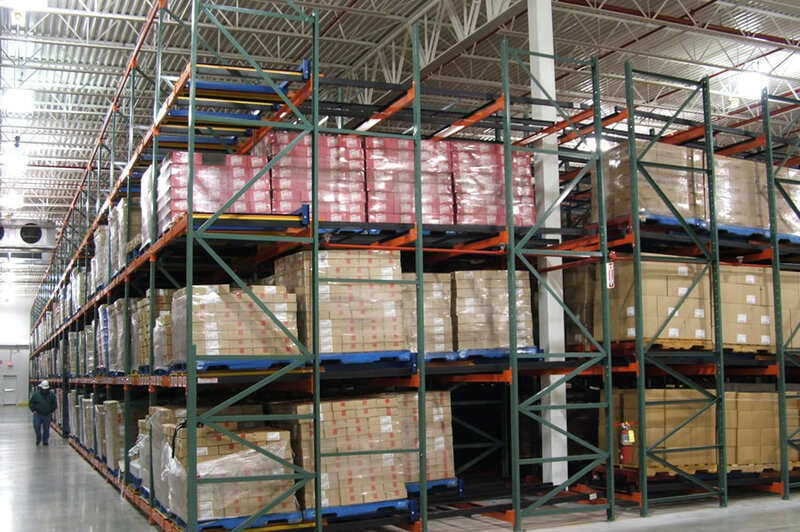 The E-Distribution team can evaluate your operation to see if push-back pallet rack makes sense for your unique storage needs; however, generally, this type of pallet racking storage system, is at least 4 lanes x push-back depth for proper rotation.